Bruce Sterling structured this book using the Shakespeare's All the world's a stagepassage. He matches each stage with a technology innovation and attempts to describe how it will develope and affect society in the next fifty years. He asks two quetsions: What does it mean, and how does it feel. This book started as an easy read. I agree with most of his thoughts. He uses a lot of compares and contrasts in each chapter. Drawing on history to explain the future. From the middle chapters, the writing starts to drag on a bit. The book ends on the topic/stage of death, which is appropriate as it ends without much commentary. I enjoy this book in the sense that it is a meta book. It contains a lot of pointers to reference materials that sound very interesting. From the Kevin Kelly book, to Emerson's American Scholar, to "things that think", etc. I will add those to my reading stack. This writeup here is less of a review, more of my reading notes I took from the keypoints in the book for myself. You really need to read the entire book to what this is all about and judge for yourself. Stering argues against the fear of big genetic engineering -- making superbabies, the perfect human. Obsolecence is built in to the process. The superbabies of today will be sub par by the time he or she grows up. Technolgy advances. There is simply no benefits to make superbabies. He predicts that all the action is at the single cell level. Use bacteria to make drugs. Use micro organism to grow and control the garden.Sterility is a bad word. Living bateria is your friend. He uses mitochondria as an example for useful microbes that lives inside you. Farming andn healing are two lines of human work that are prehistoric, planted at the very basis of civilization. During the whole course of history, healing and farming have been in continuous, roiling development, full of excitement and crises and massive, terrible failures, with nothing less at state than our life and our death. Genetics cannot make either of these ancient arts more stable. It will drive htem both into stampede. Learning is not the center of school life. Today's young stedents are being civilized for an older civilization than our own. 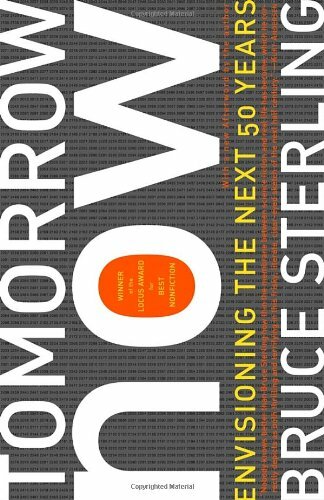 Stering makes many references to Kvein Kelly's New Rules for the New Economy. The new academia is moving too fast. There is a "canon panic". A permanent dis-equilibrium. He compares the future state to Ralph Waldo Emerson's famous speech in 1837. "The American Scholar". Emerson's canon for the American scholar is "Transcendentalism". The future is better described by Kevin Kelly. Sterling suggest two new virtues for a twenty-first century scholar: flexibility and patiences. Flexibility because there is a permanent dis-equlibrium in the new world. Note that permanent dis-equalibrium is not something bad, terrible, and dangerous. Walking, he notes, is permanent dis-equilibrium. Patiences, because we as human will outlast the machines and all the changes in the world. In the old world, we have John Ruskin's 19th century concept of Pathetic Fallacy : Human projects our human feelings onto symbolic externalities. The pathetic fallacy is a confusion between the powerful way we fell inside and the indifferent way that the world actually works. In the new world, look at MIT Professor Gershefeld's "things that Think" research.